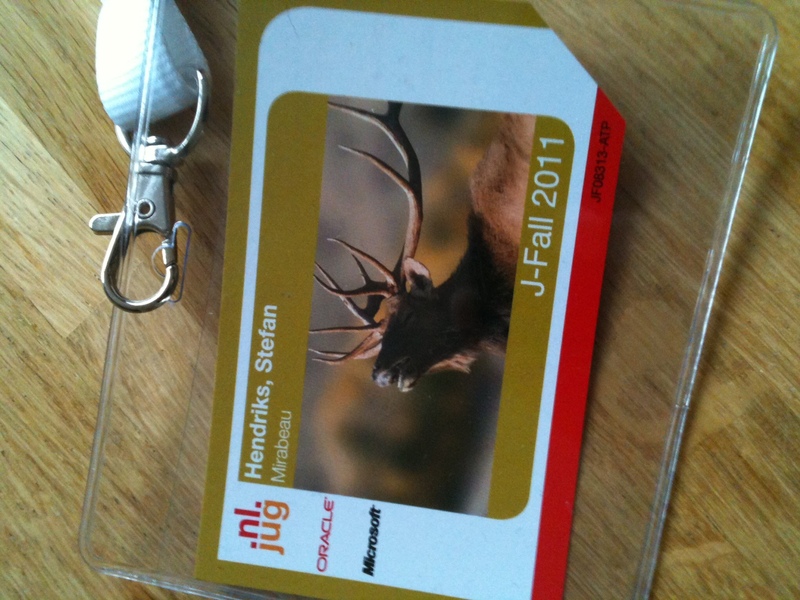 I’ve visited JFall, a conference held by the NLJUG (Dutch Java User Group), at 2 november 2011. In this blog I’d like to share my experiences of this conference. This was my first time at this conference and I pretty much had no expectations. For each topic I will write down my personal experiences. They are by no means complete. In fact they are completely biased. If you also have visited the JFall conference and you feel different about one of the topics; let me know in the comments below. The keynote consisted of two parts: The first part was about Oracle; how they are not that bad and how they had a rough year in 2010. All I was thinking was : “get on with it“. The second part was about Java 7. It took quite some time before Java 7 was released. (yes Java 7 is released already). In this part it was explained why it took so long and how Oracle played a role in getting it released. This one was actually quite interesting. The talk was about a remote execution framework. Roughly said you could connect to a remote machine via this API, and then execute commands there. Its main goal is to make automated deployment easier. What I missed is they “why” part. Why is this framework built in the first place? What kind of trouble was this framework meant to solve primarily? Although the start of this session was a bit clumsy; it was really hands on. We did a lot of practice stuff, but also here I did not get any answer to why and when I should use Clojure in the first place. Someone asked if it was used within webapplications. But it seems it is not used that much at all within webapps. (is this so?) The language itself is something to get used to, and 50 minutes was really too short for this. It did spark interest a bit. What I found most intriguing is that using Clojure it forces you to think differently about solving problems. I found that very valuable. Microsoft presenting at a Java conference, who would have thought that? I think this actually was a great way for Microsoft to show how their attitude towards the Java community has changed. And for good reason. There are tons of Java powered (web) applications and Windows Azure is a platform capable of running them. The keynote was given at a high speed; and it had (very daring) a live demo. Of course something went wrong, but in the end things did work. Also everybody could get a 30 day free trial of Windows Azure. The presentation concentrated about the effort needed to run Java based applications into Windows Azure. Also, it showed what configuration was needed to actually deploy an application. Aside the Java ‘support’ at Windows Azure, some architect schema’s where shown of well known websites (Flickr, Twitter, etc) and the match with Windows Azure was made. (Like: Yes you can do all these things with Windows Azure). A) Migrate to a new Spring version. B) migrate to Java EE 6. Since we both know the subject of this presentation we are *not* choosing option A. Then the ‘fun’ part begins. The reasons given to use Java EE is mostly “because it is the standard”. I always get the chills of such comments. What is the standard anyway? Its a pitty, because the reason that Spring is propriety software is actually valid. However, it just won’t cut it when yelling “its the standard“. Then it begins, the migration path. And guess what the first step is: Update to the latest spring version. The reason is that Spring has a great backwards compatibility. One would wonder why to migrate further away from Spring from that point. Basically migrating to the latest Spring version would be easier, painless and won’t cost your business that much. Something different that struck me was an example of how Spring is unable to render objects given by a (JDBCTemplate) DAO as you will be presented with a LazyInitializationException. So the solution in Java EE is that you put an anotation that says the bean scope is “Request”. Apart from the fact that Spring can do this too, it is also in my opinion (in Java EE and in Spring) a bad practice. I think that objects returned by DAO’s should *never* be used in the view. They are not the same thing, so don’t even try it. If you do you’re being lazy. I think the presentation would be much better if the starting point would be an assignment like “build a web application”. Then you could argue if you would need Spring and why not (since it would be about Java EE 6). Then, you could show everybody how Java EE 6 is capable of doing things Spring can do and how much it has been improved. This would probably be much better than bashing into an existing (older) Spring application and telling everybody to migrate just for the sake of standards. I don’t think any customer would be willing to pay that bill. I love refactoring, so this one was more of a nice way to close the day. To me it was more like a rehearsal and getting the vocabulary right. I actually found that quite a positive side. Too bad it only lasted 50 minutes, which was way too short. The introduction was also a bit too long so the actual development time was not that long. It was big. It was busy. It was very nice to experience. Often I wanted more, more in depth, more time. I see that as a good thing :). On the other hand, I think the NLJug should consider to spread JFall over two days. This way people can choose between several sessions, and the sessions given can be longer and allowed to be more in depth. Especially if the program has some repitition in it, I could choose to visit some workshops on day one, and then watch the presentations at day two which I would have missed at day one.